When this was the topic that was voted on by those of you over on Twitter, I wasn’t really sure what I was going to do. I put the option in there because, frankly, the warlock patrons are pretty lacking. This isn’t to say that you cannot get a diverse set of warlocks. In fact, I think warlocks are probably one of the classes with the most diversity among builds. Between patron, pact type, spell selection, and invocation selection there are all kinds of ways to build your character and choose how it plays. That being said, there is a thematic approach that stems from the patrons and the class abilities granted by those patrons. To really diversify your warlocks, as with any class, it helps to establish something a little more flavorful. Today I am hoping to approach this as best I can. In the past I have given solutions for being a druid that turns into dinosaurs and even some suggestions on different totem animals for barbarians. As with those attempts, I want to change as little as possible mechanically. Today I have a variety of ideas and some of them may take some maneuvering if not tweaking, so strap in we’re going to stretch the feel of our core three warlock patrons! We have to start here, even if it is a simple and reiterative thing to do. Let’s discuss our three patron choices and what they are. First we have the Fiend, your generic super-powerful fiend that offers you the ability to get what you desire. Of course what it costs is usually your soul. Second we have the Archfey, a enigmatic creature of the faerie realm whose web you have become entangled in. It might be a being of benevolence or one of malevolence. Or it might not care and you are simply entertainment that doubles as a tool. Finally we have the Great Old One which represents all things Lovecraftian that exists in D&D and, honestly, D&D doesn’t do enough to embrace the Far Realm and the pulpy spin they could put on their own version of the mythos given the high fantasy setting. But I digress. These are our three choices and they are really good ones, representing a trio of not insignificant powers that exist in the cosmos without being a part of any pantheon. Most of these creatures rival the gods and goddesses themselves and, rightfully, are able to grant power to those who might further their cause, for if there is any commonality here these sources of power are going to be selfish in the doling out of that power. 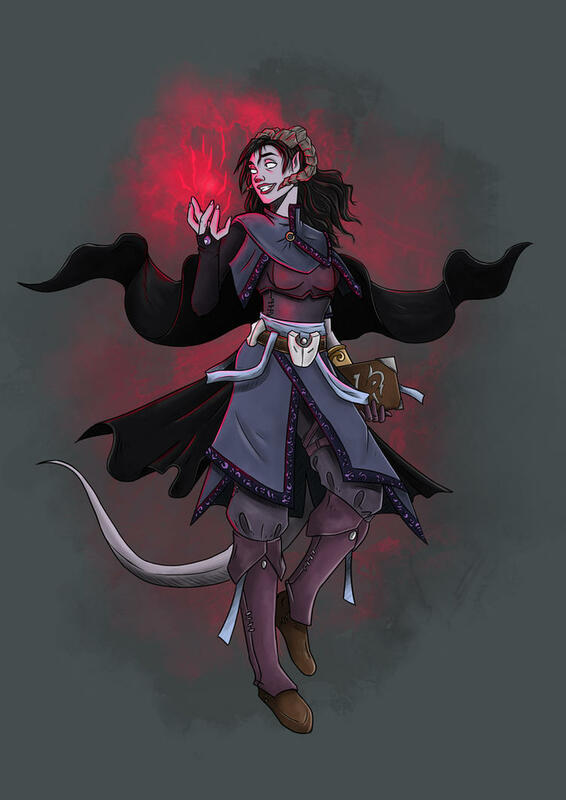 A tiefling warlock by SilkyNoire on DeviantArt. Why these three though? Well I already mentioned that they are powers of the universe without being the types to have churches and religious followers. Why not someone else though? Let’s take a quick look back at the warlock to get some insight. Warlock could arguably be the turning point in WotC’s experimentation at the end of the third edition and its rework (3.5). The developers toyed with a lot of ideas at that time. Look at any of the later books like Incarnum or Tome of Magic. It is obvious that there was a lot of probing what people wanted to see and what worked. Mixing and matching melee classes and magic was done all sorts of ways, but this was the first time we got a strictly magic class that didn’t have a backbone of worry for spell slots. Eldritch blast, the mainstay of warlocks, allowed you to play a caster that could use magic to attack all the time. No more buying bolts, sling stones, or arrows and praying you could get away without them. This idea was a driving force behind 4th edition, alongside the idea of making classes like fighter feel powerful without making someone plan 6 years of campaign worth of feats in hopes that the build would work and come to fruition. Warlock was so strong a presence that it made the cut for the 1st Player’s Handbook of that edition when monk, druid, and bard did not! And what do we find in that first offering? Three options, in this case they were called pacts as their was no distinguishing between the types we see in 5E. All the distinguishable aspects came from the source of power be it infernal, fey, or stars. I think it important to look at because classes and their builds were defined by their powers and what they could do in combat. More than that, each power comes with a flavorful description that further defines not just the play style but what it looks or feels like. This type of thinking is key to re-skinning and if any of you want ideas for such things I suggest you delve 4E, there are plenty to be had there. I also think it is important because this is the premiere of the warlock as an official core class and the 5th Edition is built upon its style quite a bit. As a quick insight what we have is the powerful, resolve-based might of an infernal pact, the tricky and charismatic fey pact, and the weird, psychically touched star pact. These pacts are what translated into the different patron options we have today. Looking at these three patron choices, and the fact that they dominate the abilities and choices we get as a warlock in 5th Edition, we can look at each one to determine the type of play style or character that they help mold. This is important since we don’t want to change anything mechanically. We just want to find ways to utilize these patrons as something else that fit the bill. So we will start here. The first patron is the Archfey which has clear undertones of fey creatures (obviously), illusion, and nature. Their abilities are utilitarian in design with a measure of control over what is going on. 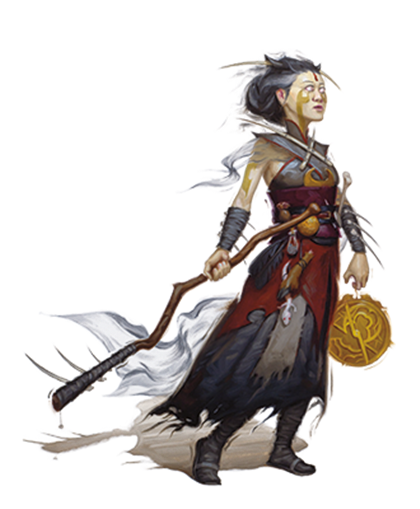 Through magic a warlock of an Archfey patron will be able to magically frighten their enemies, charm them, and teleport away from danger. Next we have the Fiend who is, very much, a risk taker, meant to get into danger, deal lots of damage, and (hopefully) make it out. Their utility powers involve surviving damage but not avoiding it, gaining temporary HP form killing blows, and playing the odds on skill checks. Aside from all the fire-related bonus spell options, their final ability is a powerful attack that not only harms the enemy but takes them out of the fight temporarily. Finally we have the Great Old One who maintains the concept that our warlock has survived knowledge they shouldn’t and become psychically resilient. Their abilities are mental and/or psychic in nature, along with a nice dose of weird. Many of the abilities granted are utility: allowing you to talk to your allies psychically, create thralls from unwilling adversaries, and punish those who think their will stronger than your own. The style of each of these is clear, but not core to their patrons as they may have been in 4E. Without unique powers built from and describing these concepts we just have a taste of them and much of it honestly comes from the spell lists. So to re-skin this lot, we have plenty of wiggle room in 5th Edition! There is one absolutely surefire way to triple down on the options sitting in this book. All we need to do is simply mix abilities and spell lists from each of the given patrons to get us a lot more flavor. Because each set of abilities dictates more of a style of play that fits the given patron more than a specific theme attached to that patron, the full suite of abilities for each could be applied to any other. This is especially true given the non-specific concept that is the patron. The fiend could be any powerful yugoloth, demon lord, or archdevil. The entry even says as much in the book. The problem is that there are beings that might make use of trickery like Pazuzu and grant abilities more akin to the Archfey. Or there is someone like Zuggtmoy who might act more like a Great Old One by using fungal spores and their manipulation to create the same abilities. I mean, even myconids can effectively speak telepathically via spores! Keep going with the idea and it is easy to find or create a psychically charged master mind style Archfey to replace the Great Old One or a stubborn and powerful fey spirit to replace the Fiend. All we need to make these work is to switch spell lists. As examples we would use the Archfey abilities and the Fiend spell list for Pazuzu or we might use the Great Old One abilities and Archfey spell list for a master mind psychic fey lord. You might be thinking, “okay this sounds great, but I see some problems” and you would be on to something. Using the Fiend spell list alongside the Great Old One ability set really doesn’t do Zuggtmoy justice does it? What on earth does she want to do with fire? Nothing, I’m sure. So how do we fix that? In that case I wouldn’t even change anything about Great Old One, I would literally just say hey, it’s fiend but this is the build and it works because mushrooms. You could do the same with a hot-headed Lady of Summer and the as-is Fiend build. Hells take Archfey and give yourself a powerful ultraloth that has a particular affinity with plant-life and you can do the same again. As you can see we can get more options by doing even less than I was originally asking of you. Just the same, by doing some different types of mix and match we can go ahead and create even more options still. Take the builds in the book. Okay, now take those spell lists. Throw them out. Decide on a more specific patron or the theme of that patron. Is the Queen of Air and Darkness your Archfey patron? Maybe you should replace those spells with some that include lightning, wind, and putting out lights (just to state the obvious). Made a pact with Orcus? Get rid of those fire spells and get yourself some necromancy! Looking to make deals with Yog-Sothoth? Then focus on things that manipulate movement and speed since he has control over time and space. Each spell list can be manipulated to represent a specific entity or the persona of an entity you may be discovering together. The point is, you shouldn’t feel shackled to hellfire if you have an infernal pact and not all Archfey sit in lush forests playing tricks with glamours. I know I spent a time in the beginning speed-highlighting the concepts around the warlock trinity. Cleverness and charm, power and destruction, and finally madness and will. I did this to build up a mindset that we could pull apart and set aside the assumptions of the patron. From there we can use these things in different ways. Many a powerful fiend relies on charm and trickery. How do you think Asmodeus maintains his power? By breaking the inherent assumptions like Archfey = illusions and nature or psychic potential = Great Old Ones, we can start to grasp at even grander ideas thinking outside the box. The very first idea I had to do this article was to re-skin one of the patrons to be slaad-related. The problem I had was that they were close to fiends as inherently destructive, but also incredibly Lovecraftian and should be Great Old One adjacent if nothing else. BUT metal control, let alone stability, is not really a thing relating to slaads. So what do we do with them? Personally, I think the Fiend is a good backbone, but you need a selection of spells that fits either fiend or archfey. Even more ideally you might make a slaad lord or use one like Rennbuu Lord of Colors. Things like chromatic orb would be perfect options for that one! Easier re-skins come in many forms, all you need to do is think of them. Below I throw out some ideas for you to play with and take the challenge of fully re-skinning on yourself! Yuan-ti Gods – Great Old One perhaps? The possibilities are pretty endless without creating whole new abilities and this only scratches the surface with the core patrons. Add in those from Xanathar’s and you have even more room to play. Let me know about your ideas. What powerful creature would you use one of the core patrons for? What mix and match would you do for a specific example? Let me know about your warlock below!! !